Almost everyone observes that the Dame 3 is very comfortable and can be worn all day. According to most testers, the traction works pretty well. Many users appreciate how the lacing system can be customized for added comfort and lockdown. Most comment that the D Lillard 3, like the LeBron 16 from Nike, is very stylish and is great for daily use. The shoes provide great support, several report. A lot of users love the balanced feel of the Bounce cushioning. Some said that the upper feels soft and is easy to break-in. Many find the shoes affordable and of good quality. Majority of the reviewers give these Damian Lillard shoes a high rating. The Adidas D Lillard 3 runs long and narrow according to most. Some users find the shoes bulky and clunky. The Dame 3 requires some break-in time according to several wearers. These Lillard shoes have poor ankle support, a handful wrote. Another Adidas basketball shoe that reportedly has poor ankle support is the Harden Vol. 3. A good number of testers experienced heel slippage. The Adidas D Lillard 3 is a great basketball sneaker. It’s a slight improvement from the D Lillard 2 and will accommodate most types of players and foot shapes. Affordability, style, comfort, balanced cushioning, good traction, support, and materials; the Dame 3 simply has it all. This is how to make an affordable signature sneaker without leaving out all the good stuff. This is not gonna be in my rotation. I'm kinda disappointed. 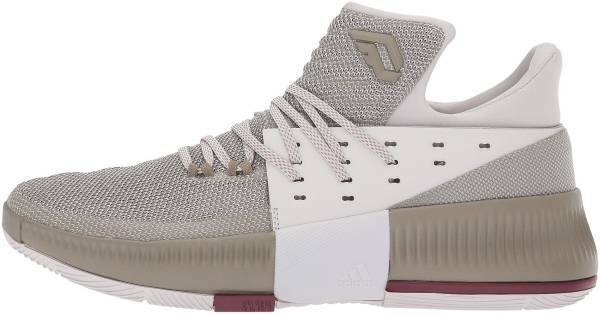 The adidas DAME 3 is an amazing shoe that slightly improved in almost all areas from the Lillard 2.0. What more could you want. Check out the Dame 3 if you need court feel, cushioning, and traction with a durable upper. Humbled by each win and starved by each defeat, Damian Lillard’s style of play is the major inspiration for these basketball sneakers. The D Lillard 3 has a supportive FUSEDMESH upper for a secure lockdown as you break to the basket. Bounce delivers energized cushioning through the clutch. The tread pattern pays tribute to his roots and is inspired by the first courts to see his greatness. The Adidas D Lillard 3 is built to showcase all of Dame’s elite skills. Scoring, passing, and lockdown defense; the Dame 3 helps you do it all on the court. Cushion. Bounce cushioning keeps your every step energized all day long. The Adidas D Lillard 3 has full-length dual-density Bounce that provides enhanced comfort, flexibility, and responsiveness. The midsole wraps around the shoe, allowing the foot to sit low for added court feel. An internal torsion plate and an outrigger provide stability. Traction. A unique tread pattern is featured on the Adidas Dame 3’s outsole and is based on Lillard’s childhood courts. Multi-directional blade traction keeps you grounded during quick lateral motions. Length and Width. The fit of the Dame 3 is similar to the D Lillard 2. Wide-footers are advised by reviewers to go true to size. Narrow-footers are advised to go down half a size. Lockdown. The Adidas D Lillard 3 features a TechFit sock bootie and a customizable lacing system. The bootie construction locks your foot down snugly and securely. The lace panel has multiple lacing options for a customized fit. Adidas introduced FUSEDMESH into the upper pattern of the Dame 3. FUSEDMESH is a TPU-based yarn that’s woven together. It’s designed with areas of support and stretch to help ensure a custom fit while keeping it nice and soft for step-in comfort. FUSEDMESH provides lightweight and breathable support. This material paired with dual-density Bounce provides comfort straight out of the box. The mid-top design of the Adidas D Lillard 3 utilizes a new slip-on construction with a flexible ankle collar that makes entry easy. The sneaker also features a unique lace panel; anybody can choose how to lace their shoe to suit their style. Like the first two iterations, this shoe tells a story. It pays tribute to Lillard’s family and his humble beginnings. With the Dame 3, we go back to his roots. “With this being my third shoe, it’s all about appreciation for the people that went out of their way so I’d be able to hoop growing up,” Dame said in an interview. On the right toe, there are three initials for his mother and his two grandmothers; on the left are initials for his father and his grandfather. 56316 is built into the outsole tread pattern. This number is displayed on the telephone pole in front of his grandparents’ house where he learned to shoot on a milk crate. On the outrigger, if you put the shoes together, you’ll get the coordinates of Dame’s hometown neighborhood, Brookfield. WEARING THE LETTER O is printed on the left sock liner. The phrase pays tribute to Dame’s pre-game introduction in Portland and his debut album titled The Letter O. O also signifies the three locations most important to his career: Oakland, Ogden, and Oregon which is printed on the right sock liner. Damian’s third signature sneaker saw fewer releases than its predecessor the D Lillard 2. Adidas’s 2017 Black History Month collection pays tribute to Arthur Ashe - the first African-American selected to the US Davis Cup team and the only black athlete to win a singles title at the US Open, Australian Open, and Wimbledon. The D Lillard 3 ‘BHM’ is dressed in white and black with a multicolored inner lining. A “1975” graphic is a nod to Arthur’s No.1 world ranking and Wimbledon win. Found on the right sockliner is the phrase “Arthur Ashe Activist Advocate” to commemorate his contributions beyond sports. The Three Stripes celebrates the Year of the Rooster with the launch of the D Lillard 3 ‘Chinese New Year’ colorway. These Dame basketball shoes are dressed in white, black, and red. A Year of the Rooster graphic wraps the midsole while the acronym “CNY” can be found on the heel. This all-black colorway is a nod to Damian’s ability to finish off a game with his clutch performances. The Adidas D Lillard 3 ‘Lights Out’ is inspired by his 51-point performance against the Warriors in 2016 and his series-winning 3-pointer against the Rockets during the 2014 Playoffs. This colorway is a look back at Damian’s journey from a young kid in Oregon to a rising star in Ogden. The D Lillard 3 ‘Wasatch Front’ is dressed in his college colors of dark grey, light grey, white, and purple. Wasatch Front is a mountain range that borders Ogden and is the name of his second track off of his debut album that details his journey. These Dame sneakers feature an off-white upper that is a nod to the gym’s walls. Completing the theme are burgundy and cargo accents that represent the aging bleachers, unfinished floors, and wooden backboards.